Polish Bitter Vodka for the Stomach (Żołądkowa Gorzka) is part of the long tradition in Poland of infusing vodka with fruit and herbs known as nalweka. The process, I which I absolutely love, dates back to the 16th century. Originally popular and exclusive to the manor homes, by the mid 1800s, everyone was making nalweka and many books on the subject were starting to appear. This particular flavored vodka has the added benefit of being good for the health. Or at least that’s what every one I’ve talked to in Poland believes. It is accepted as fact. I came across one Polish blog that went on for a full paragraph promising that Żołądkowa Gorzka is what is needed to fix many a digestive ailment. Improved digestion aside, we drink it because we like the taste. We like it so much that we took a bottle on a trip to Ireland where we rendezvoused with our niece and her fiance. They loved the stomach vodka, and were excited to tell us they had found it stateside when they returned. On one visit to the USA while we were living in Poland, I knew I would visit the restaurant of a chef I had connected with online. I brought along a small bottle of Żołądkowa Gorzka that I picked up in the duty-free shop at the Poznan airport. He loved it. It’s become our go-to gift from Poland. 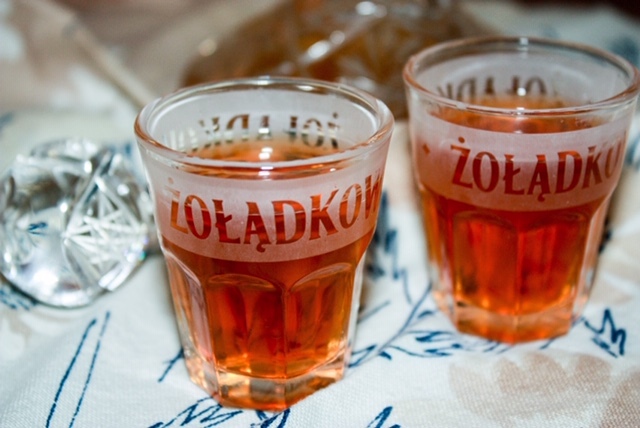 What flavors the vodka in Żołądkowa Gorzka? My usual reference from tinctures the Great Book of Tinctures, uses black coffee and honey to flavor Żołądkowa made with spiritus and rum. For this recipe, I’m ignoring the great book and taking inspiration from a couple of Polish websites, Polki.pl and Wielkie Żarcie. The bottle of stomach vodka we purchased stateside says it’s an orange and clove flavored vodka. Both of those flavors are present in my recipe, but there are other spices too. And while I think clove is often needed, I like it in very small doses, so you may choose to give it more prominence than I do. I think the spice combo will be one to play around with. I’m thinking the next batch might include star anise and a few raisins. A word of warning – the ground spices will sink to the bottom and become kind of a sludge, much like when I make chai with ground spices. You’ll lose some of the liquid volume because of this. The Amazon links on this page are part of an affiliate program, earning a small commission for this website. 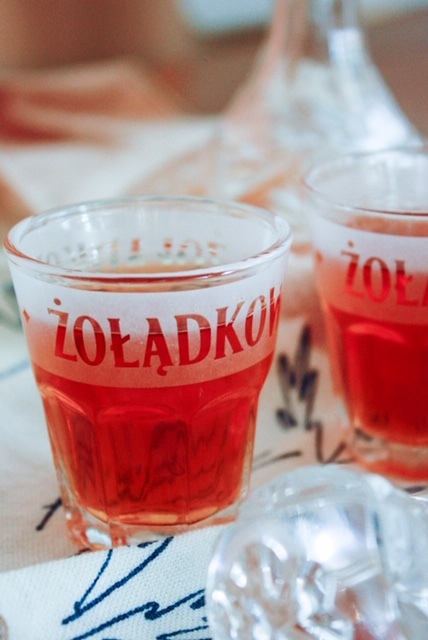 If you’re looking for a use other than sipping a chilled shot of Żołądkowa Gorzka after dinner, I have a few ideas for you. Have you tried Żołądkowa Gorzka? If you haven’t been able to find it near you, now you can make your own! This sounds awesome! I’m gonna make this. Made it! Now to wait 2 months.